How to Respond to “Everyone Else is Doing It” Avoid peer pressure. We all know the classic phrase. “Everyone else is doing it!” Another variation is, “All the kids my age have one!” The classic response to the classic phrase is, “If everyone else jumped off a cliff, would you?” While this response is funny and classic, and we adults have just been waiting to say it to our own children, it rarely leaves the child thinking, “You know. Mom’s right. 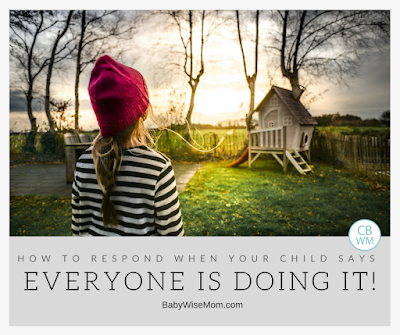 I don’t need that.” Here are some helpful ways to respond when your child uses peer pressure against you. This is my most common response because it is true. Of course not everyone is doing anything, but I also am in communication with the parents of my children’s closest friend. So when my child says, “Everyone has an Instagram account.” I say, “No they don’t.” I then name their five closest friends who ALL don’t have one. Because I know. 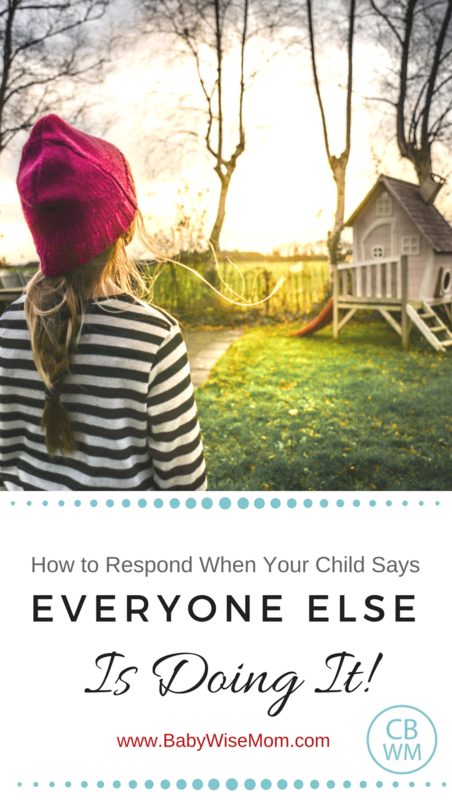 This is my favorite response to use because it immediately shuts down the “everyone” argument and the child is left trying to figure out a new way to talk me into whatever they had in mind. 2-That Is So Exciting For Them! Even if not everyone is doing it, someone IS doing it. This is a moment your natural instinct will be to disparage the choice the other family made to allow it. Parents like to list off all the reasons the child would actually not like that in an effort to make the child feel better. The problem is that for the child to use that information to feel better, he also has to disparage the choice. Then the child is turning to his friends and saying, “Here is why the way you have it is actually dumb.” It breeds a culture of comparing and jealousy. I like to talk about how that person must really enjoy whatever it is. We can also enjoy the way we have it at our house. It is different, and that is okay. Both choices have their perks and it is okay to be happy for someone who has something you don’t. Do not criticize the way other people parent to make your kids feel better about their life situation. Back to the Instagram example. I explained that the reason we don’t allow Instagram yet is that the federal government has set laws that protect children online if they are 12 and under. Those laws are only protective if you do not falsify your age in order to set up an account. Once you tell the Internet you are older in order to have an account, you aren’t protected in the same way. I explained we would discuss the matter more at age 13, but that I wasn’t decided for sure on if we would even allow it at age 13. For now, we are sticking with the age 13 because that is a rule on the platform. That makes the decision easily made for us. Humans compare. We just do. What a gift you give your child if you train her to see those differences and be happy for the other person while still working to be happy for herself. It is a skill that can be learned with practice. When you find “everyone else” is doing something, it can be an opportunity to evaluate if the rules you have are indeed best, but never succumb to your own “peer pressure” and allow your child to do something you don’t feel is right for her. Be mindful, thoughtful, and prayerful. Change when it seems appropriate. Always stick to what you feel is best for your family and your child. I love these ideas! My oldest is only 5 but I know this is coming soon.